Now here is a hike that offers it all. Even though it is relatively steep to start, most of the hike is along an outstanding ridge with absolutely excellent vistas of Mt Rainier, Mt Adams, Mt Margaret, and Mt St Helens. In season, this hike is a living flower garden with more beauty than the eye can behold. The hike begins along Forest Road 2612 near Ryan Lake. At first the trail follows an old logging road, but it quickly becomes purely a foot trail. The trail is quite steep during the first 2 miles as you climb through dense forest to the	ridge of Goat Mountain. As you reach the ridge, you break out into more open areas with incredible views. In season the trail is surrounded by beautiful floral displays. And no matter the season, you eyes will wear out absorbing the views. The trail follows westward along the south side of the ridge line of Goat Mountain. 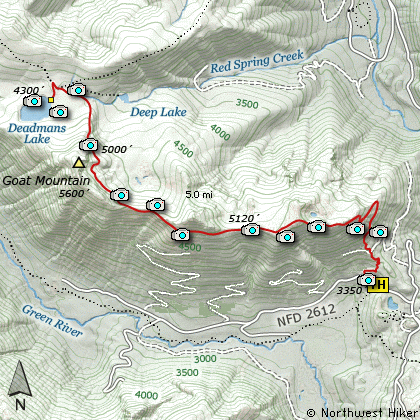 There is a visible users trail to the top of Goat Mountain, but this CD does not cover that. As your walk west on this trail Mt St Helens becomes hidden by the Mt Margaret formation that lies between Mt St Helens and the Green River Valley below you. As you walk along this portion of the trail you will see stark evidence of boundary of the Mt St Helens destruction. When you arrived on top of the Goat Mountain ridge you are walking through an area that never was damaged by the 1980 event. But at about 3 miles, you walk right out into the open where the blast forces killed everything. At about 4 miles, the trail switches sides of the ridge. Crossing over the ridge to the north side, you gain additional vistas to the north and northeast. As you walk over the crest of the ridge line, you will clearly see the terminus of the Mt St Helens blast zone. At this point, the trail begins its descent to Deadmans Lake. About half way down the ridge, the trail enters a dense young forest. You never break out of the forest, until you are standing on the lake shore. The east and south sides of the lake have excellent vistas. After turning onto Forest Road 99, you will climb westward for about 9 miles before coming to Forest Road 26 on your right, which takes you past the Norway Pass TH and the Goat Mtn TH. You continue on for a about 3.7 miles and you will pass the spur road to the Ryan Lake overlook. Just a short distance past this, you will come to Forest Road 2612 on your left. Turn left onto FR2612 for about a tenth of a mile and the trailhead to this hike will be on your right.